Fly wheels up to 20 MT.Tons. ULTRA SOUND testing for crack delection. Fly Wheel shafts EM-8 Class IV Forged material. - C.I. or steel casted. - Flywheels up to 20' diameter. - Flywheels up to 20 M.T. weight. - Turned to zero eccentricity. 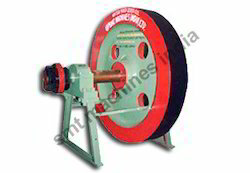 The precision engineered Fly Wheel Assemblies offered by us are fabricated by our expert team of technocrats. Our Fly Wheel Assemblies are manufactured using premium grade material and are known for their durability and precision finish. We also meet customized requirement. 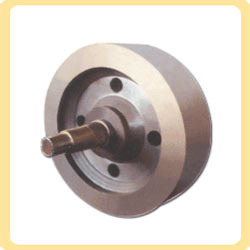 These fly wheel assemblies are applied in varied industry verticals for manufacturing process. Type c. I. Casted / steel casted / steel fabricated statically & dynamically balanced. weight 2 ton - 17 ton rpm 300 - 750 mounting it should be mounted on en-8 forged steel shaft fitted with double row spherical roller bearing, brackets & pedestals. - c. I. Casted / steel casted / steel fabricated statically & dynamically balanced. spherical roller bearing & brackets & pedestals. We are having a well setup to give timely delivery of products according to your requirements.